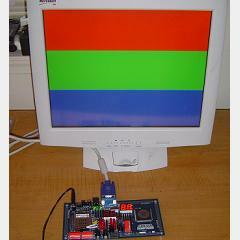 Once again we’ll take a look at how to generate VGA timing signals. This time with a different approach using the VHDL programming language with the Altera UP2 board. This method is far more flexible and reliable so it is definitely worth a look. This was tested on multiple monitors; LCD, CRT & Projecters. It worked on all three. It’s possible that some really picky monitor exists that won’t like the VGA input but I doubt that the software for this is at fault, recheck that you have the pins mapped correctly. I use your code and it didn’t work but when i changed the number it worked! How to create VGA with VHDL is very unique and simple. thank you for sharing.